Thor (Chris Hemsworth), for those of you who skipped the Norse mythology part of your childhood or avoided the comic (does anyone know a die-hard Thor fan? I’ve been told they exist, but then people say there’s some dedicated Hulk and Dr. Strange fans, too), is the Norse god of thunder and son to Odin (Anthony Hopkins), king of Asgard, an alien planet or alternate plane of existence (I’m not entirely sure). A thousand or so years ago the Asgardians fought the frost giants, led by Laufey (Colm Feore), to protect earth and preserve something called the Casket of Ancient Winters. Fast-forward to the present, when those knucklehead frost giants are at it again. This time they invade Asgard to back steal the casket, and Thor disobeys his father when he travels to Jotunheim to rough up Laufey. Truth be known, this isn’t the review I wanted to write. Trust me, it would be a lot easier to heap glowing praise on this over-hyped tale of a Norse God who is banished to earth, but the movie just wasn’t my cup of mead. I’m convinced someone must have messed with my 3D glasses. Based on ecstatic word of mouth, I should have seen a thrilling, well executed, well acted, and good looking film. Instead, I saw a dull, erratically paced film with gaudy set pieces, tacky costumes, and inconsistent writing. Admittedly, I am no master of the Marvel universe, so take that with a grain of salt. However, I am game, and have enjoyed several of the movies culled from their stable of superheroes in recent years. Throw director Kenneth Branagh into the mix, and I am not only intrigued, but a little giddy. I guess that might be part of the reason I was so disappointed in the film; I expected better with Branaugh at the helm. The film tells the story of Thor, a Norse God who wields a mighty wicked hammer as his weapon of choice against the bad guys. Thor resides in the realm of Asgard, and he is a sure shot to take over the throne from his aging father Odin (Anthony Hopkins). Odin has maintained peace between his kingdom and the Frost Giants, a rival population, for years. When they threaten to infiltrate Asgard, Thor makes a hasty decision to attack the Frost Giants. 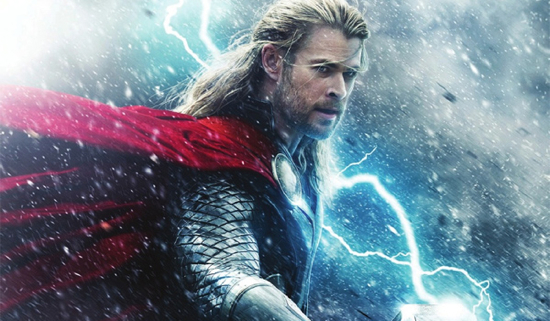 This infuriates his father, who banishes Thor to Earth, and strips Thor’s hammer of any real power.